Rustic Bullet and Revolver Jewelry Box | BUDK.com - Knives & Swords At The Lowest Prices! Don’t let a boring, nondescript jewelry box ruin your otherwise impeccably decorated home or office. 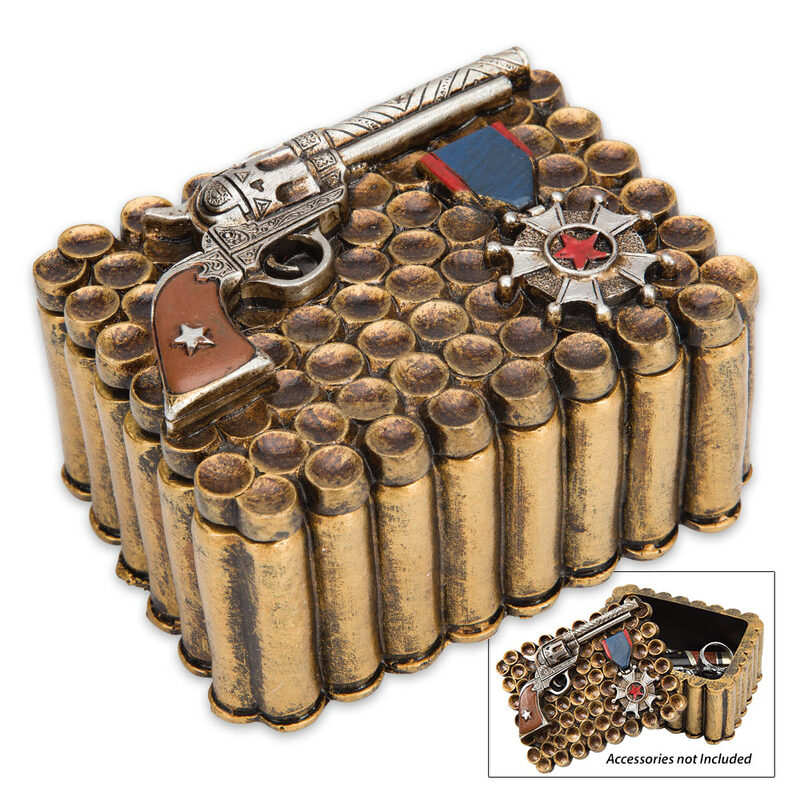 Make your jewelry box a vibrant, eye-catching showpiece with this quirky, undeniably cool Bullet and Revolver Jewelry Box! Stylishly weathered and beautifully detailed, this unique storage box appears as though it's fashioned from vintage brass bullets. 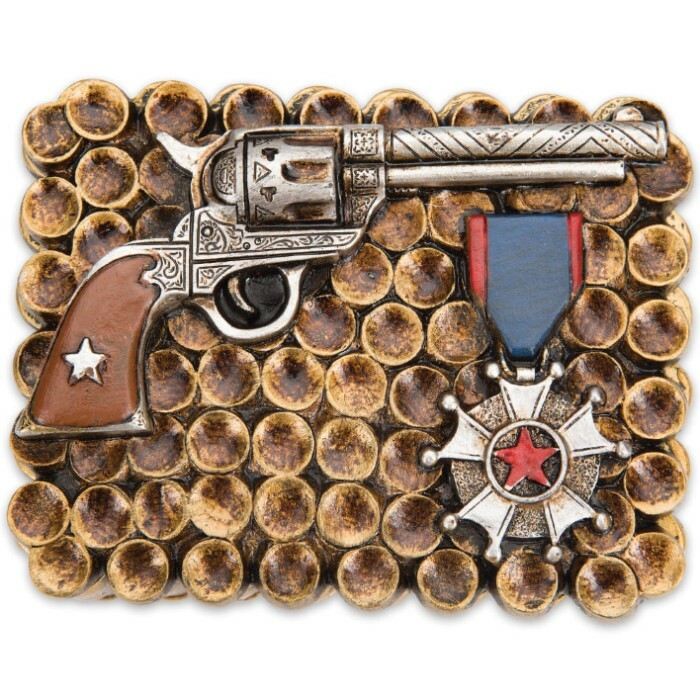 The lid is crowned with a classic Wild West revolver replica and a stately military-esque medallion. This ain't your mama's jewelry box, that's for sure! And it's great for more than just jewelry! Ditch your unsightly change jar and toss spare coins into this decidedly more attractive alternative. Use it to store medication, lip balm, contact lens accessories and other small bathroom staples, reducing clutter and freeing up space on your vanity. There's really no wrong way to enjoy this all-purpose piece of practical home decor! Made of advanced polyresin, it's stronger and resists moisture damage better than jewelry boxes made of wood and other more traditional materials. 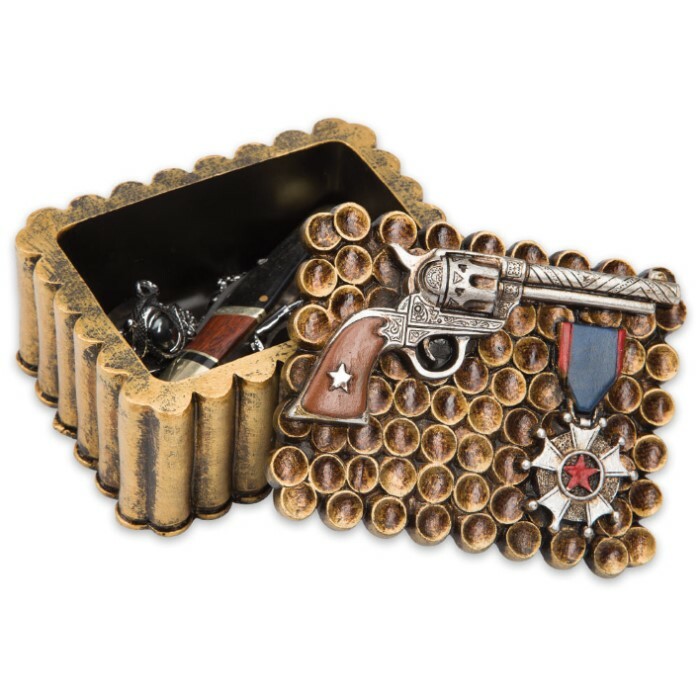 Regardless of how you use it, the Bullet and Revolver Jewelry Box is sure to put a smile on every face! It also makes a great gift for anyone - especially someone with an adventurous sense of style!